WIND farms are providing clean, green energy – but are they making people sick? FIRST the dogs on Andy Thomas’s farm start to howl. They sense a change in the air as the three 45m turbine blades turn into the wind. Then the blades begin to revolve. Depending on the weather and distance, they can sound like an approaching windstorm, an oncoming train or a jet engine revving for takeoff. At best they make a rhythmic, pounding swoosh. Thomas runs a 283ha sheep farm near Burra in the Mid-North. He is a no-nonsense bloke whose family has been in the Hallett area for 150 years. The nearest 80m- high turbine is just over a kilometre away but he is close enough to hear more than 10 of them as they create electricity from the wind along the Bald Hill Ranges. “There are probably around 12 that impact on a fella,” Thomas says. Like many country people, he supported the idea of a wind farm. It was hard to argue against harnessing the wind to generate green electricity for the national grid while bringing economic benefits to the region. Australia is investing in wind energy at an incredible rate. The Gillard Government wants 20 per cent of the nation’s power to be green by 2020 and rewards those who invest in renewable energy. Before 2003 South Australia had one large wind turbine, at Coober Pedy. Eight years later there are 14 farms, some with 30 or more turbines. The state’s move into wind farms has been so rapid that as of late last year, more than half of Australia’s installed wind power was here – enough capacity, in theory, to provide 30 per cent of our electricity. Yet the only restriction in SA on how far a turbine can be built from a house is on the measurable noise that they make. Western Australia has mandated a 2km buffer zone between turbines and the nearest house, as has Victoria, where the Liberal Premier, Ted Baillieu, last year campaigned in support of those who were struggling with living near them. “These are people with real issues, they’re in real locations with real lives and real problems,” Baillieu said. Here in SA, the Environment Protection Authority’s head of science and sustainability, Peter Dolan, argues our reliance on noise limits offers greater protection than a blanket setback rule. “We have the most onerous guidelines in the country,” he says. The problem, however, is not just the sound but an alleged condition – denied by the turbine owners – called wind turbine syndrome, which is a cluster of complaints triggered not just by noise but by infrasound. The noise is inaudible but there are fears that the pulsating low frequency soundwaves can cause a malaise not unlike seasickeness. And like seasickness, it strikes some people and not others. SOUTH of Mt Bryan at Waterloo, 30km south-east of Clare, residents are leaving town. Drive through the sleepy hamlet – the home of former Birdsville Track mailman Tom Kruse whose picture is on the town’s sign – and there are protest signs on gates in the main street. The 37 turbines at the Waterloo farm dominate the dry and stony landscape. They run for about 15km along a ridge 4km west of the Tothill Belt, and each has a 3MW generator, 30 per cent bigger than those at Mt Bryan. Their size and proximity to the town may explain why the Waterloo farm, more than any other in SA, seems to be tearing a local community apart. The turbines have to be close to the mains supply because wind power cannot be stored; it has to go straight into the grid. Most of Waterloo’s problems can be traced to its location near the Robertstown power interconnector, a grid intersection point. There are those to whom the turbines make no difference; they sleep as normal, like the way they look, and welcome the green investment. Others seem to be struggling to survive. There is a serious body of anecdotal evidence in SA that says living close to wind turbines is at very least disruptive to lifestyle and potentially damaging to health. Small pockets of anger and resentment are bubbling away at toxic levels in Mt Bryan, Waterloo and parts of the South-East, as it is in communities in Victoria and New South Wales. Similar stories have come out of the UK, Canada and Europe. There is no scientific evidence that wind farms, when properly installed, are harmful. But something is clearly going on. What alarms some people – particularly those living in the turbines’ shadow – is that there is no reputable scientific evidence to say that living close to a wind farm is not harmful to health. The Australian National Health and Medical Research Council conducted a literature review and concluded that there was nothing supporting a conclusion of adverse effects. The wind farm companies argue there is no problem. “We do not accept that wind turbine syndrome exists,” says AGL’s head of wind energy in Australia, Steven Altschwager. 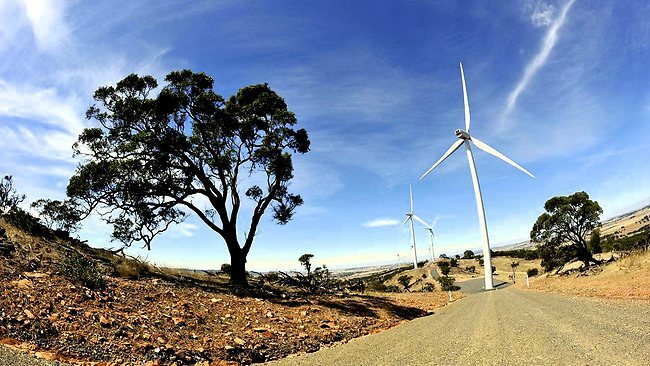 Acciona, which is behind the proposed Allendale East wind farmin the state’s South-East, says there is a small number of anecdotal reports that have not been backed by scientific or medical research, or diagnosis. They have Premier Mike Rann’s support. When protesters turned out at the opening of the Waterloo farm in February, he dismissed their concerns. “There are 100,000 turbines around the world and there has been study after study and there have been no negative health impacts,” Rann said. Protesters are calling for a moratorium on any more wind farms until the medical issues have been conclusively resolved. Last year a former rural GP from Crystal Brook, Sarah Laurie, founded the Waubra Foundation, a national wind farm protest group named after the Victorian wind farm near Ballarat which has more than 100 turbines. Last month a former Liberal Minister for Health, Michael Woolridge, became a director. His presence is something of a coup for the group’s credibility. “Being a doctor he is aware of the problem; being a former health minister he understands completely what it takes to change the views,” says fellow director Peter Mitchell, an engineer. The committee is due to report next month and so far more than 800 submissions have been received. One is from Richard Paltridge, a dairy farmer who last year challenged Acciona in the Environment Resources and Development Court over the proposed $175 million, 46-turbine wind farm near his dairy at Allendale East. At least six of the turbines will be less than 1km from his dairy and at night his cows will be in a paddock 500m away. He is worried about the impact of shadow flicker from the rotating blades, turbine noise and infrasound on the milk production of his herd. A decision is expected this month. The opposition to wind farms is not about greenies versus the rest. Ally Fricker would seem to be a prime candidate for embracing wind energy. A pioneer of the anti-pesticide movement, in the 1970s she opened Stall 72, the first organic food stall at the Adelaide Central Market. She later formed the Organic Food Movement which developed some of the first guidelines for organic produce. She is a greenie who remains implacably opposed to nuclear energy. In 1996 she and her partner, Bob Lamb, bought a small property near Waterloo in an area where there was still natural bush. Stories circulate in these communities about gag clauses that stop those who sign contracts for turbines from speaking against them. While confidentiality surrounds the commercial deal done between the power company and the landowner on whose property a turbine will be built, the claims that people cannot speak out are denied. Acciona, a large Spanish-owned company, says their contracts contain no such clause. “There is nothing in any or our contracts that would impose any confidential obligations on people to speak about any health concerns they might have,” says Acciona communications director, Tricia Kent. The company also denied having intervened to prevent a former Waubra resident, Trish Godfrey, from giving evidence early this year in the Allendale East case. “We took no action to prevent Mrs Godfrey from testifying,” Kent insists. Julie Quast joined the protest campaign with great reluctance. The Waterloo wind farm has destroyed her personal dream. She and her husband bought on the ridge six years ago when plans for the wind farm were in abeyance. She says she saw paperwork from the company saying it was not going ahead. They intended to build on the hill and use the land for crops, sheep and alpacas. Not long after, the wind farm was revived. Money is partly driving this division. It is widely agreed that the power companies pay landholders about $10,000 a year to place a turbine on their property. So far, none of those who are being paid have complained. But the unequal spread of rewards has contributed to the bitterness. Julie Quast refuses on principle to allow one on her land, saying she would feel hypocritical. So someone else is being paid for the wind turbines that are causing her problems. Ben and Kerry Heinrich are paid about $30,000 a year for three turbines at Waterloo and the nearest is less than 500m from their back door. Heinrich, whose mixed farm is just off the Barrier Highway, says his family is not bothered by them. “Maybe sometimes when you’re lying in bed you can just hear it but it doesn’t affect us. We all sleep like babies,” he says. But he agrees the money is important. Heinrich, who has a young daughter, Emmison, understands the community division and says he would not have allowed the turbines so close without a financial incentive. “I can understand people who aren’t getting paid but who have them nearby getting a bit funny about it, if they can hear them,” he says. In the case of Andy Thomas, the sound from AGL’s turbines at Mt Bryan exceeds EPA levels and they have been working with him for more than a year trying to lower the noise. The problem is what the company calls “tonality”, a discernible tone coming out of the gearbox. They also, Thomas says, removed the flashing red lights. Late last year AGL shut down six machines for two weeks and packed foam inside to deaden the noise. It didn’t work. Next they experimented with shutting down six turbines when the wind reached certain speeds. It helped but is a temporary solution. “We see (shutting down turbines) as a temporary solution to keep Andy in a position to be able to enjoy his property without us interfering with him,” says Altschwager. and – not unlike a traffic jam of electricity signals – the lines clog up when the wind blows. But Roaring 40s plans to build two more wind farms near Waterloo, one at Stony Gap to the north on a continuation of the Tothills, and another at Robertstown to the east. If it happens, Fricker says she will leave. “We consider those areas like a buffer to the Tothill Belt and they contain patches of remnant peppermint gum which is highly endangered as an ecosystem,” she says.